Check the Fien Print: MovieWatch: "Mr. Brooks"
There's something slightly off-brand about "Mr. Brooks," like Fruit Rings in the cereal aisle instead of Fruit Loops, like the store expects that you'd willingly pay a buck less on the assumption that Kelloggs doesn't have any particular patent on the tasty flavor of the recognizable cereal. But if I'm getting "Oat Ovals," I'd rather just get Cheerios. Perhaps that's just the way I was raised? In any case, "Mr. Brooks" feels a smidge muted, a bit cinematically taupe. I think the director, "Kuffs" auteur Bruce Evans, would tell you that he decided to mostly underplay the movie since its script and subject matter were so lurid. That's not a strategy I'd necessarily criticize except to say that while I was mostly intellectually involved with the movie -- studying its machinations, its few very find performances, its very well-conceived production design -- I never cared much what was happening or how it was eventually going to resolve. The couple next to me, they were obviously involved with how the plot was going to untwist itself. Through the entire film, they kept trying to figure out the various character motivations and kept loudly guessing what surprises were going to be coming next. Either to the credit of the filmmakers, or to the demerit of said old couple, they weren't correct at any point. Evans and co-writer Raynold Gideon have woven an elaborate tapestry of serial killers (mostly Kevin Costner's self-hating Mr. Brooks and his gleeful alter ego played by William Hurt), cops (mostly Demi Moore, making a fine comeback performance) and the voyeurs (mostly Dane Cook, who should go back to accumulating MySpace friends) who love them. While so many films in this genre attempt to keep their narratives spare, the writers of "Mr. Brooks" have gone overboard to add seemingly endless backstories and subplots. Everything gets wrapped up by the end, but it takes a lot of coincidence and contrivance to let everything pay off. And even once things pay off, "Mr. Brooks" rather optimistically sets itself up to be the first film of a sortta odd franchise. I have always been a fan of Kevin Costner, despite his frequent accent-based difficulties. As Evil Kevin Costner performances go, his work here is well below his much more malevolent and threatening turn in Clint Eastwood's "Perfect World," though it's still as cool and calculating as you could hope for. He doesn't have to be big, because that's William Hurt's job and Hurt cackles, sneers and works every ripe line of dialogue flawlessly. Hurt is a master of the measured, flat delivery and Costner is, at the very least, a savvy veteran, so they're a good team. Cook is embarrassingly out of his league at times, but it's possible that the role demanded amateurish looseness, which he has in spades. There's something nice about seeing the 44-year-old Moore and the 48-year-old (is that possible?!?!?) Marg Helgenberger looking so great up on the big screen. 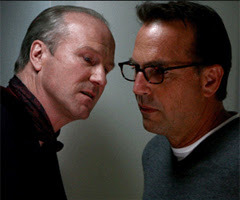 Maybe my reservations on the movie come from how very many serial killer movies there are out there and how hard "Mr. Brooks" has to work to seem vaguely fresh. It's not without ideas -- the concept of mass killing as an addiction, potentially genetically transmitted, isn't awful -- and it's not without some solid execution. Maybe what's lacking is inspiration?